...from getting tax papers together (the thing I hate the most about freelancing) to have a reading lessons. We also reviewed our coins and amounts because next week we are so going to do this fabulous, educational lapbook. Cross my pocketbook and hope to not owe Uncle Sam any pennies, nickels, or dimes. The garden my family contemplated last spring? The one we didn't do last summer? Well, my brother-in-law no longer works out-of-town and the economy is in a sorry state of decline. So we're attempting to muster up that Little Red Hen within all of us and explore the possibilities of what one acre of land can do. Perhaps even start a Hobby Farm like my other brother-in-law did. Outside my window. . . beautiful sunny day! My French doors are wide open. Leaves are dancing, birds are singing, breezes are flirting. It does the body good! I am thinking. . . about scheduling that field trip to the Mardi Gras Museum for my Louisiana History Class. I am thankful for. . . having Internet back up and a son and husband who know all the technical things I don't know. From the schoolroom. . . Garrett is working on Literature & Grammar assignments due at co-op on Monday. Chelsea is sitting in front of sitting room heating stove and finishing Wildflower Girl (she has really enjoyed this book---covers the Irish potato famine, immigration, early American life, etc. I will probably get her the sequel which comes out this year: The Fields of Home). Annie is playing with the Christmas mice. From the kitchen. . . I am creating. . . sewing projects with my 11-yr-old daughter. She's on a designing, sewing craze at the moment and I want to encourage her. We went to the fabric store and bought dress material for Lucy and Ariana. I am going. . . to find Chelsea some shoes this afternoon. I am reading. . .A Mother's Rule of Life by Holly Pierlot...I'm doing lots of reviewing. I am hoping. . . to get some serious writing projects done this year. Please pray for these and me. I am hearing. . . Annie singing to her mouse. Observing the Liturgical Calendar: I'm finding that the Magnificat spiritual guide is a perfect fit for me. Around the house. . . we've been keeping our messes cleaned-up and down to a minimum lately. I'm very pleased. One of my favorite things. . . weekends! A few plans for the rest of the week. . . I know we have a basketball game tonight and dinner at Oma's on Sunday. I haven't looked at my planner for next week. I'm avoiding it. and held a massive postcard campaign to encourage our senators and representative to fight against FOCA. After a weeklong sabbatical from the Internet, we waited for the cable guy to come with his magical technological tools and hook us up, rewire us, redirect us, and welcome us back to the land of the plugged-in. We had no other plans outside of the cable guy and history for the day: the Inauguration of the 44th President of the United States of America. Oma and Opa had just had their coffee and left. I had just collected the mail. We had just finished two hours worth of school work. The cable guy now resided in my sacred sanctuary computer chair. "Okay," I addressed the troops, "the cable is back up in time for the swearing in of the President." "Who?" The seven-yr-old was already dragging out a game of Clue. "The President, honey. We're getting a new President today and we're going to listen to his speech." Chelsea answered something...I don't remember...but I saw that the expression in Annie's eyes never changed. Quite possibly the speech would be a little over her head. "Okay, well, Garrett has to listen to the speech. You, my dear, have to at least watch him being sworn into office. He's going to put his hand on the same Bible that President Abraham Lincoln used. Isn't that cool?" "Why?" Light wisps of brown hair dangled in front of her face and puffed out with each pondering thought. "Because, we have a new President. And he's our first Africian-American President. We're living history at this very moment and I want us to be a part of it." Sure, keep talking, Mom. My plans never seem to go as smoothly or idealistically as I plan. "Mom, when I grow up and am a mom, I'm going to teach the Snack Prep class at co-op." And off Annie ran to the pantry in search of the blueberry muffin mix she knew we had in there somewheres. She became consumed with making blueberry muffins for the cable guy. That was her history in the making. A lesson in generosity. Chelsea began pulling down cookbooks, pulling out mixing bowls and ingredients, and pulling forth Snickerdoodle cookies so that, when the historical Bible was brought forward, Chelsea was on her hands and knees cleaning a tray of broken eggs off the kitchen floor. I kid you not! That was her history in the making. A lesson in cleanliness and servitude. The swearing in happened so quickly that only Annie and I were in front of the television to witness the moment---my arm wrapped around her waist, a red wisk drizzled richly with blueberry batter in her hand, and a sticky smear of blueberry batter alongside her mouth---along with the cable guy sitting in my sacred sanctuary computer chair. The older children had left for morning college classes. That was their history in the making. A lesson in accountability and duty. Garrett was no where to be found when Obama placed his hand on the historical Bible. Hopefully he was doing some history. I attempted to talk to Annie about the event of the day but was met with more "Whos?" and "Whys?" as she gave her red wire wisk a careful cross-eyed inspection. I tracked Garrett down in his room where he was watching the Presidental speech. I played hit and miss with the speech while trying to supervise some of the baking going on in the kitchen. "When I was a young man, I thought life was all about me---about how I'd make my way in the world, become successful, and get the things I want. But then the two of you came into my world with all your curiosity and mischief and those smiles that never fail to fill my heart and light up my day. And suddenly, all my big plans for myself didn't seem so important anymore. I soon found that the greatest joy in my life was the joy I saw in yours. And I realized that my own life wouldn't count for much unless I was able to ensure that you had every opportunity for happiness and fulfillment in yours. In the end, girls, that's why I ran for President: because of what I want for you and for every child in this nation. "She helped me understand that America is great not because it is perfect but because it can always be made better---and that the unfinished work of perfecting our union falls to each of us. It's a charge we pass on to our children, coming closer with each new generation to what we know America should be." I was arrogant enough to think that yesterday had to be boxed into a history lesson for my children. My children did what was in them to do: explore, question, bake, watch, squirm, disappear, react. They held about as much interest in this momentous occasion as I remember having towards adult-like occasions when I was in the first, fifth, and ninth grade. I got what I needed from the lesson and I went on about my business. I'm sure I left my parents and teachers exasperated more than once. The lesson yesterday was mine to be had. The lesson was mine to remember that I am responsible for my children. The lesson was mine to give them hope and opportunities to succeed. The lesson was mine to remember the preciousness of each of my children. The lesson was mine to remember that the potential each of my children possess is far greater than anything I can present to them. The lesson was mine to remember to "challenge them, inspire them and instill in them a sense of wonder about the world around them." God has given me this immense responsibility. And it is a privilege. It is an honor. It is also a sacrifice. One that I embrace willingly. I believe that one discovers many things about a man from the things he writes about or for his children. I like to believe that anyway. And, for the parent who loves his children, there is hope...much hope...always hope. Certainly Christ had hope in us when he opened his arms on that cross and said, "Father, forgive them. They know not what they do." Most of us don't have a clue as to what we're doing, or what we should be doing. We're arrogant if we think we do. Christ taught us how to do what we need to do. 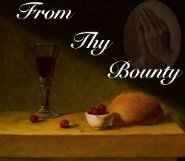 Can't we be Christlike now, even if it means dying to self for the good of others? Can't we turn to the thief on the side of us and know that we might walk side by side with him into heaven? We just might! It is our duty, as Americans and as Christians, to pray for our new President's leadership and to continue the "unfinished work of perfecting our union...to what we know America should be." 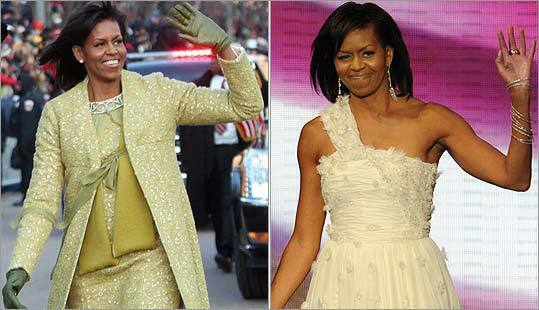 What did you think of Michelle Obama's inauguration dresses? Outside My Window... it's pitch black with an orange moon in the sky. I am thankful for... a warm house. From the schoolroom...some unfinished work from today is lying on the sitting room table waiting for a new day to dawn. I am creating... a religious lesson for tomorrow's CCD class. I am going...to bed in a few minutes. I am reading... I'm not reading much this week. What I am doing is dusting off some of our dear Five-in-a-Row books. There are still some I have not rowed with Annie and I think Chelsea will enjoy the ride down memory lane with us. I also have the Sonlight catalog in my bookbag because I'm wanting to get back on track with our Explorers' study and I need chapter books for the 9th and 5th graders. I am hoping... the coughs and sore throats won't turn into something worse. I am hearing... Annie jump around the living room and play basketball with the laundry hamper and playdoh containers...yes, at 10:30 PM. One of my favorite things...a good school week. Around the house... the heater is clicking on and off keeping us comfortably warm, the dryer is warming nice fluffy towels for us, the dishwasher is silently scalding the dishes for us, and my computer keeps me company while the rest of the house sleeps. Technology is a wonderful thing and I am grateful. Can you spot my littlest angel? All the grandchildren and great-grandchildren (minus 3 great granddaughters). And we won (both girl and boy teams) which makes the sauce a lot sweeter.